The year 2002 will be remembered as a low point in the long conflict between Palestinians and Israelis, when diplomacy came to a standstill, emotions boiled over, blood ran in the streets, and the prospects of all-out war drew closer. Anti-Zionist and anti-Semitic furies seemingly put to rest suddenly revived with stunning vehemence. The existence of Israel appeared imperiled as it had not been for decades. This picture is accurate as far as it goes, but it omits one other salient feature of the landscape in 2002. The year also witnessed a host of new plans, initiatives, and schemes for fixing the situation. None of these ideas came from the Palestinian side - hardly surprising, given that Yasir Arafat seems to see violence against Israelis as the solution to all his problems. Instead, they issued from various parties in Israel and the United States, with an echo or two from Europe and the Arab states. These plans, of which the best known is the Bush administration's "road map," run the gamut from tough-seeming to appeasing. But they have two qualities in common. All of them give up on the Oslo-era assumption of Palestinian-Israeli comity as the basis for negotiation. But at the same time, all of them proceed from a fundamentally flawed understanding of the conflict and therefore, if actually implemented, would be likely to increase tensions. None of them can lead to a resolution of the conflict; that requires an entirely different approach. 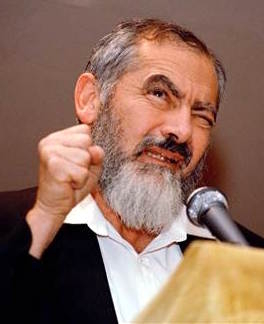 Meir Kahane advocated "transfer" of Palestinians out of the West Bank. Suggestions for resolving the conflict fall into three main categories. The first consists of proposals for Israel to retain a significant portion of the territories won in the 1967 war while effectuating a unilateral separation from the Palestinians living there. The toughest idea under this heading calls for an involuntary "transfer": expelling the Palestinians, if necessary against their will, from the West Bank and perhaps from Gaza as well. Once a fringe view, this proposal, thanks to protracted Palestinian violence, has begun to win support in Israel. A February 2002 poll showed 35 percent of respondents wanting to "transfer the residents of the territories to Arab states." A March 2002 poll, asking more specifically about "annexing the territories and carrying out transfer," found 31 percent in favor. In a milder version of the same idea, some Israelis have called for encouraging a voluntary transfer. Under this plan, Palestinians who chose to leave Israeli-controlled areas could sell their land to the government of Israel, which in turn would help them get established in their new homes. An October 2001 poll reported 66 percent of Israelis supporting this scheme. Some Israelis would like to redirect Palestinian aspirations toward Jordan, a country that already has a Palestinian majority. Benny Elon, head of the Moledet party, is today the most prominent exponent of this idea, which, under the name of "Jordan is Palestine," has in the past been associated with such figures as Vladimir Jabotinsky, Yitzhak Shamir, and Ariel Sharon. Another idea along these lines, espoused by the Labor-party politician Ephraim Sneh, involves a territorial swap: the Palestinian Authority would get some Arab-majority areas inside Israel's 1967 borders in return for giving up its claims to some Jewish-majority areas on the West Bank. Perhaps the simplest proposal for separation is the one that does not require moving people. It is to build a physical wall between the two populations. "A Protective Fence: the Only Way" was a popular bumper sticker in Israel before the Sharon government began building such an electronic boundary along a 192-mile line approximately between Israel and the West Bank. Prime Minister Ariel Sharon favors a beefed-up version of this plan, with trenches and mine fields, arguing that in combination, walls and buffer zones "will contribute to the security of all Israeli citizens." The second grouping of proposals concentrates on ways of working around the present impasse toward some sort of mutual accommodation. Here the key distinction is between those who emphasize a change in Palestinian leadership and those who emphasize mechanisms for improving the existing climate of mistrust. The former, focused on getting Yasir Arafat out, divide again between some (like Benjamin ben Eliezer of Labor) who favor a policy of waiting until a new Palestinian leadership emerges on its own and others (like Benjamin Netanyahu of Likud) who urge Israel actively to remove Arafat and replace him with a more pragmatic and flexible leadership that Netanyahu says is "waiting in the wings." As for those who stress new mechanisms, they would offer benefits to the Palestinians on condition that the latter make certain changes in their internal arrangements. One such condition is good governance. Originally proposed by Natan Sharansky, Israel's deputy prime minister, this idea was picked up by George W. Bush, who devoted a major policy speech to the subject in June 2002. Proclaiming that it is "untenable for Palestinians to live in squalor and occupation," the President outlined a vision whereby, as a means toward acquiring a state that would live in peace alongside Israel, the Palestinians would develop "entirely new political and economic institutions based on democracy, market economics, and action against terrorism." He specifically mentioned transparent financial institutions, independent auditing, and an independent judiciary. The "Road Map", first adopted in September, might be thought of as the State Department's belated answer to the President's June 2002 proposal. The product of consultations by the "Quartet" (the United States, Russia, the European Union, and the United Nations), it bears a name (the "concrete, three-phase implementation road map") that suggests its incremental quality. The first phase, proposed for early this year, would have the Palestinians hold "free, fair, and credible elections" and Israel withdraw to its positions of September 28, 2000 "as the security situation improves." The second phase, to kick in later in the year, will "focus on the option of creating a Palestinian state with provisional borders based upon a new constitution." The final phase (2004-05) will see Israeli-Palestinian negotiations "aimed at a permanent-status solution"; once these are achieved, Israel would pull back from territories it won in 1967 "to secure and recognized borders." The road map is vague about conditions to be imposed on the Palestinians - and specifically about what, if any, penalties they would pay for noncompliance. But there are some - and they make up the third grouping in the constellation of new ideas - who chafe at conditions altogether, preferring to proceed in the hope that an ample supply of carrots will lead to the desired result. Henry Hyde, chairman of the House International Relations Committee, has proposed a "Marshall Plan" for the Middle East that promises the Palestinians (and others) a comprehensive economic development program. The core of this idea, which has the support of Tom Lantos, the committee's ranking Democrat, is, in Hyde's words, that "people who had hope of a better life in economic terms would not resort to violence." Martin Indyk, a former U.S. ambassador to Israel, favors a more muscular and faster device. He calls for international troops to establish a "trusteeship" over the West Bank and Gaza and thereby lay the basis for "credible, representative, accountable, and transparent institutions." Thomas Friedman, the New York Times columnist, has proposed a scheme whereby "a joint American-Palestinian security force" would replace Israeli control over the territories, followed by American troops who would stay on "indefinitely." Third, there is the most popular idea of all: no transfer, no wall, no change in leadership, no conditions, no road map, and no foreign troops. Rather, Israel should immediately withdraw all its forces from the territories, dismantle all the Jewish towns and outposts there, and close down whatever remains of its machinery of control. The goal is to inspire a reciprocal mood of accommodation by the Palestinians or, failing that, a de-facto separation that would benefit both sides. "Leave the Settlements, Return to Ourselves" is how the left-wing Israeli organization Peace Now promotes this notion. Variants of the same idea have been put forward by such figures as Amram Mitzna (the recent Labor candidate for prime minister), by Saudi Crown Prince Abdallah, by virtually every European government, and by the overwhelming majority of leftists, academics, journalists, and diplomats around the world, not to speak of religious and business leaders. Each of these plans has major deficiencies. The forceful removal of Palestinian Arabs from Israeli-controlled territories would indeed reduce Israeli casualties, but the political price, both abroad and within Israel, would be incalculable, rendering this option more fantastical than real. The voluntary departure of Palestinians is even more unrealistic. Jordan-is-Palestine is a non-starter for many reasons, of which the single most important is that neither Jordanians nor Palestinians show the slightest readiness to go along with it. * Since there is no inclination among Palestinians to accept Jordan as a substitute for Palestine, much less Amman for Jerusalem, the only conceivable outcome of such a policy, were it somehow implemented, would be to add Jordan as a base for the Palestinian conquest of Israel. As for fences and buffer zones, they offer poor protection. Terrorists can go over a fence in gliders, around it in boats, or under it in tunnels; they can fire mortars or rockets over a wall, pass through checkpoints using false identification papers, and recruit Israeli Arabs or Western sympathizers on the wall's other side. Once a wall goes up, moreover, Israel would effectively surrender its influence over what happens beyond it, within the Palestinian Authority, including the latter's ability to import weapons and foreign troops. Nor, finally, would hunkering down behind a fence send the Palestinians the intended message, convincing them to give up on violence; on the contrary, it would likely reinforce an impression of Israel as a cowering and essentially passive society, thus spurring further violence. In sum: a fence may have utility as a tactical tool to save lives, but none as a basis for ending the conflict. What about changes in Palestinian leadership? Every piece of evidence suggests, and every opinion poll confirms, that the assault on Israel of the past two and a half years has been wildly popular among Palestinians. Indeed, there is ample reason to believe that the "street" is more aggressively anti-Zionist than the leadership. Although Arafat promotes the ambition of destroying Israel, he is not the source of that ambition, and his removal would not eliminate it. More particularly, the ben Eliezer plan - waiting for a change of leadership - rests on the far-from-obvious supposition that the next leaders will be better than the existing ones, while the Netanyahu plan suffers from the kiss-of-death syndrome that applies to any Palestinian leadership selected by Israel. Which brings us to the various proposals for conferring benefits on the Palestinians in hopes of moderating their hostility. The reasoning here is backward. Although good governance, for example, is certainly welcome in principle, it is less than desirable so long as the Palestinians continue to seek Israel's destruction. It brings to mind the notion of ending the cold war by encouraging "entirely new political and economic institutions" in the Soviet Union even as that system's core ideology remained fully intact. Why should anyone want to enhance an aggressor's competence and economic reach? The same criticism, and more, applies to Congressman Hyde's update of the Marshall Plan. To the extent the original Marshall Plan worked,† it filled a need for capital, which is hardly the Palestinian economy's main challenge; the PA's terminally corrupt leadership would pocket much of the aid; and the Palestinian war against Israel has very little to do with poverty or any other economic issue. Fundamentally, though, the Hyde proposal suffers from the same conceptual mistake as good governance: it promises to reward the Palestinians even as they make war on Israel. Is it too banal to note that the original Marshall Plan was instituted three years after the crushing defeat of Nazi Germany in war? Then there is the road map, which asks the Palestinians to undertake a temporary reduction in violence, in return for which they will gain a state; as such, the road map imposes even fewer demands on the Palestinians than the failed Oslo process that it has been designed to replace, and makes even less pretense of expecting the Palestinians to comply with its conditions. The "on ramp" and other such plans share precisely the same errors, some to an even greater extent. And the various proposals to use foreign soldiers and intermediaries in what is now a war zone are plainly unworkable; can anyone seriously imagine Americans, Canadians, and Europeans accepting fatalities just to keep Palestinians from attacking Israelis? It is preposterous, no matter how bravely they might talk in advance. Finally, we have the immensely popular plan obliging a unilateral Israeli pullback from the West Bank and Gaza in return for precisely nothing, which is by far the worst option of all. If proof were needed, a precedent does exist: namely, the entire past decade, when, under Oslo, Israel took uncounted "steps for peace" and was rewarded by its Palestinian "partner" with a much more aggressive enmity. The outstanding instance, however, remains the unilateral Israeli pullback from Lebanon in May 2000, undertaken in the firm conviction that it would purchase quiet on Israel's northern border. Not only has that not happened, but, given Hizbullah's massive arsenal and overconfidence, the violence there is likely to get much more intense, possibly leading to all-out war. In the meantime, Israel's withdrawal from Lebanon played a major role in spurring the outbreak of Palestinian violence in September 2000. One can only shudder at the carnage that would follow upon Israel's headlong flight from the majority-Palestinian territories. Although a neutral term like "Arab-Israeli conflict" makes it sound as if both sides were equally to blame for this decades-long war, and must therefore be brought to compromise by splitting the differences between them, this is, as Norman Podhoretz has rightly insisted, "a deceptive label." A more accurate term is the "Arab war against Israel." Israeli control of the West Bank and Gaza cannot be the core of the problem. The Arab war against Israel predated Israel's taking those territories in 1967; in fact, it was under way even before Israel formally came into existence as a state. Rather, the root cause of the conflict remains today what it has always been: the Arab rejection of any sovereign Jewish presence between the Jordan River and the Mediterranean Sea. The conflict continues into its sixth decade because Arabs expect they can defeat and then destroy the state of Israel. Israel cannot end this conflict unilaterally, by actions of its own. It can only take steps that will make it more rather than less likely that the Arabs will give up on those expectations. At the heart of the problem, in other words, stands Arab rejection. However cunningly conceived, plans that attempt to outflank, leap over, or otherwise finesse this stubborn fact are doomed to failure. Instead of ignoring it, would-be peacemakers would do better to start by recognizing that the conflict will diminish only when the Arabs finally surrender their dream of obliterating the Jewish state, and then to concentrate on finding ways to get the Arabs to undergo what I call a "change of heart." How might that be achieved? A glance at some of the conflicts of the 20th century provides a clue. Those that ended did so because one side wholly abandoned its war aims. Closure was achieved when, and because, there was no longer a fight. This is what happened in World War II and the cold war, and also in the wars between China and India, between North Vietnam and the United States, between Great Britain and Argentina, between Afghanistan and the Soviet Union, and most recently between the United States and Afghanistan. Conflict ended neither via negotiations nor by means of a wall but by one side accepting defeat. Such a surrender can occur as a consequence of a military trouncing, or it can occur through an accumulation of economic and political pressure. However achieved, the result must be unequivocal. Should the losing side retain its war goals, then new rounds of fighting remain possible, and even likely. After World War I, for example, defeat left the Germans still looking for another chance to dominate Europe. In like fashion, the wars between North and South Korea, Pakistan and India, Iraq and Iran, and Iraq and Kuwait have not ended, for the losing side has interpreted every defeat as but partial and temporary. What will help bring about this Palestinian change of heart is Israeli deterrence: maintaining a powerful military and threatening credibly to use force when aggressed upon. This is not just a matter of tough tactics, which every Israeli government of the Left or Right pursues. It is a matter of a long-term strategic outlook. The trouble with deterrence from the Israeli point of view is that, rather than offering a chance to initiate, it is by nature a reactive approach: boring, unpleasant, expensive, seemingly passive, indirect, and thoroughly unsatisfying, quite out of step with the impatient spirit of the Israeli populace. But it works, as Israel's own experience in the period 1948-93 shows. A bedrock condition of such a strategy - and one no less frustrating in the short term - is that Palestinian acceptance of Israel is a binary proposition: yes or no, without any in-between. This suggests, in turn, the futility of negotiations - at least until the Palestinians do accept the Jewish state. Such matters as borders, water, armaments, the status of Jerusalem, Jewish communities in the West Bank and Gaza, so-called Palestinian refugees - in brief, the central issues of the Oslo period - cannot productively be discussed as long as one party still aims to murder the other. In principle, something along the lines of the Oslo agreement could turn out to be workable - but only after the Palestinians definitively and unequivocally, and over an extended period of time, demonstrate that they have made their peace with the existence of the state of Israel as an irreversible fact. If, moreover, we have learned anything over the past decade, it is that interim Israeli concessions are counterproductive and must be discouraged. As the Oslo experience proved, they inflame, rather than tamp down, Arab aggression. By offering repeated concessions even as the Palestinians failed to live up to a single one of their obligations, Israel signaled weakness. That is how, beginning in 1993, the effect of Oslo was to take a bad situation - there was some violence in the late 1980's and early 90's, but a mood of caution still prevailed on the Palestinian side - and make it far worse. Only when Palestinians are convinced there is no other way will an end to the conflict become conceivable, along with the mutual concessions that will seal it. U.S. diplomacy has long proceeded on the theory that one must start with agreements between Israel and unelected Arab leaders; after such a leader has affixed his signature to a piece of paper, it is thought, feelings of amity will in due course develop among his subjects. That has not happened. Quite the contrary: whenever leaders like Anwar Sadat or King Hussein - and this even applies somewhat to Arafat - have signed agreements, their populations have become more, not less, hostile to Israel. It is as if the government is understood to be passing on the anti-Zionist burden to other institutions: the media, the educational system, religious leaders, the unions, trade associations. A piece of paper cannot of itself produce a change of heart, but can only symbolize it; treaties must follow, not precede, deep shifts for the better on the Arab side. By the same token, it is a mistake to discuss "final-status" issues - i.e., how things will look when the conflict is over. There has been, indeed, much speculation about a future Palestinian state: its borders, the nature of its sovereignty, and so forth. All such talk encourages Palestinians to think they can win the benefits of a state without accepting Israel. This is not to say that policy planners in some sub-basement should not be thinking through the contours of a final-status agreement; but it is not for those in responsible positions of power to broach the topic. Beyond these general considerations, there are specific steps that could be taken by the government of the United States. For one thing, the time has come for the President to recognize Jerusalem as Israel's capital. By now, Congress makes an almost yearly habit of trying to force the move of the U.S. embassy to Jerusalem, but the initiative invariably fails because the embassy issue is understood by the White House as purely a matter of symbolism, and the price to be paid in Arab and Muslim anger for a purely symbolic move is always regarded as too high. But the issue is not just symbolic. U.S. recognition of Jerusalem as Israel's capital, especially if properly presented, would go far to indicate to the Palestinians that the existential issue is closed: Israel is there, it is permanent, and the sooner they come to terms with this fact, the better. For another thing, much more pressure could and should be placed on the Palestinian side to put an end to violence. The U.S. government tends to see this violence as an aberration, a temporary anomaly in Palestinian behavior. Rather, violence stands at the very heart of the Palestinian attitude toward Israel, and stopping it therefore needs to be the priority of U.S. policy - including, in the first instance, by refusing to reward it financially or diplomatically. If the hope in Washington has been that, by gaining ever more of their goals, Palestinians would curb violence on their own, that approach has clearly failed; the time has come to focus directly on the violence itself. Washington has also been largely indifferent to the massive campaign of lurid antisemitism and fanatical anti-Zionism conducted by the institutions of the Palestinian Authority, some of which are subsidized by American taxpayers. In particular, it has paid little heed to the hideous incitement of children to engage in "martyrdom" operations. This is an error that needs urgently to be reversed. Finally, there are the so-called Palestinian refugees. Alone among all the masses of dislocated peoples in the years following World War II, Palestinians are frozen in the status of refugee - in some cases, unto the fourth generation. (The vast majority of those claiming refugee status were born after the events of 1948-49 that engendered the problem in the first place.) The reason for this anomaly is plain: the rejectionist impulse is sustained through the fantasy of a mass "return," and the ever-proliferating numbers of alleged refugees amount to an ever-sharpening dagger at Israel's throat. In this cruel charade, the U.S. government has been complicit for over a half-century, contributing a substantial percentage of the funds used to maintain the Palestinians' refugee status and to discourage their integration into the Arab states. The time has come to insist that they be assimilated. There is no short-cut, and there is no alternative. The only way to make progress in the Palestinian-Israeli conflict is by inducing the Palestinians to surrender their murderous intentions vis-à-vis Israel. Not only would the rewards of such a surrender be very great but, ironically, they would be yet greater for the Palestinians than for Israel. Although Israel today suffers from blood in the streets and an economy in deep recession, and although it is the only Western country that is constantly forced to defend its very existence through military force, it remains, for all its problems, a functioning society, with a boisterous political life and a vibrant culture. In contrast, the Palestinians are in desperate straits. The areas nominally ruled by the Palestinian Authority are anarchic, with curfews, road blocks, and violence defining the immediate parameters, and dictatorship, corruption, and backwardness being among the larger consequences. In the words of one sympathetic observer, Palestinians have been "ravaged by widespread poverty, declining health status, eroding education, physical and environmental destruction, and the absence of hope." The Palestinians, in other words, are suffering even more from the consequences of their own violence than is Israel. So long as they persist in their ugly dream of destruction, they will be haunted by failure and frustration. Conversely, only when they accept the permanence of Israel will they be released to fulfill their considerable potential by building a prosperous economy, an open political system, and an attractive culture. Much as the Israelis have to gain from a victory over the Palestinians, the Palestinians have more to gain from defeat. From the point of view of American policy, helping them to achieve a change of heart is thus an unobjectionable goal, beneficial to both parties. And while ultimately it is up to the Palestinians to liberate themselves from the demons of their own irredentism, others, especially Israelis and Americans, can indeed help - by holding firm against the seductive appeal of road maps that lead exactly in the wrong direction. * Adam Garfinkle and I discussed the shortcomings of this idea in "Is Jordan Palestine?" Commentary, October 1988. † The late P.T. Bauer trenchantly deflated the notion that the Marshall Plan deserves its reputation as a magically successful program. ** A glimpse of this dynamic could be seen in 1993-94, when Palestinian acceptance of Israel seemed in the making; the governments of Syria and Iran, among others, found themselves unable either to prevent Arafat from going in this direction or to pick up his anti-Zionist mantle. May 1, 2003 update: Read replies to this article and my response at "Letters to the Editor: Does Israel Need a Plan?" July 12, 2006 update: The prediction above, that "given Hizbullah's massive arsenal and overconfidence, the violence [in Lebanon] is likely to get much more intense, possibly leading to all-out war," became a reality today. Sep. 21, 2009 update: I take up this topic again in "Peace Process or War Process?" This analysis devotes more attention to delineating and refuting the many "solutions" to the conflict; that one focuses more on the costs of the Oslo illusion.